When I was growing up in Bellville, we lived in “a 100 year old house.” (It was built in 1910, so it wasn’t quite 100 years old, but it will be in 4 more years). That house had virtually no insulation, and no central air or heat. We had gas heaters throughout the house, and a wood-burning stove in the dining room. When it got really cold one winter, I remember my mom, my brother and I sleeping on the floor in the dining room with the wood-burning stove going full blast all night… and it was still cold in the house, but the stove kept the chill off, and my mom got up dutifully to keep it stocked all night. We also kept the gas heater that was mounted in the wall running almost constantly that winter (and most winters for that matter). There’s nothing worse than stepping out of the bath or the shower onto a frigid floor in frigid air, freezing your frigid %@#&! parts off! I got a little to close, and burned my behind. I think I was about 6 or 7 when that happened. 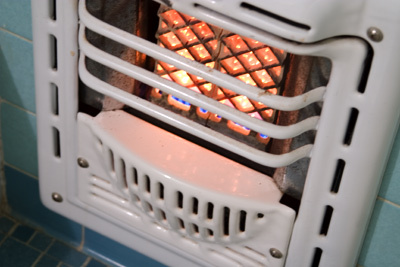 I can safely tell you that I haven’t burned my hiney on a gas heater since that time I did when I was young. It’s with fondness that I remember those gas heaters, as they were our only source of warmth in that house, and we stuck to them like glue when it was cold. Sometimes we’d use them to warm up the insides of our jackets right before we put them on as we were heading outside to play. There’s nothing like the heat that comes off a gas heater. So, tonight, while Jack was taking a bath… I started up the gas heater in our bathroom, hoping that someday, Jack will have the same fond memories I do of gas heaters. Man I’m glad we bought an old house.